Greywater Grotto is a small cave far east of Falkreath, located south-southwest of Helgen containing leveled predatory animals. The cave itself is a long descending corridor with no offshoots that follows a stream down to a shallow pool. 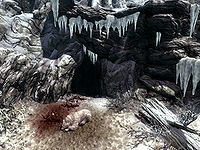 There is a leveled animal guarding the entrance, which is covered in splattered blood and gore, with a small coin purse lying on the ground among it. There are also a number of snowberry bushes in the vicinity and an iron ore vein above the entrance, found by heading west to get up and around. The animals in the cave are leveled and seem to be entirely random. You are as likely to encounter wolves as you are to encounter snowy sabre cats, snow bears, or ice wraiths depending on your level. The cave itself is entirely natural in appearance and descends in a series of plateaus with earthen ramps linking them. 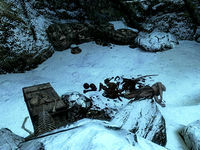 Upon entering there is a dead deer in front on a ledge with a ramp down to the left and an iron ore vein beneath it. Partway down there is a wellspring that has formed a partially frozen pool that forms a stream and flows to the south, with a corundum ore vein to the north. To the right of this the ground rises with a couple more animals found at this point before the cave continues to descend, passing a dead bandit near the west wall. A short way further, the stream forms a waterfall with the path becoming a ledge along the west wall. 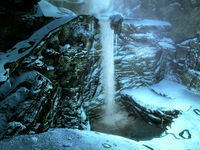 Near the bottom, the path crosses below the waterfall as a bridge over another partially frozen pool. Three more animals are found at the bottom next to an unlocked wooden chest with a second dead bandit and medium coin purse on the ground among more human debris. There is a gold ore vein against the south wall of the cave. There are no plants inside the caves, not even fungi. Whenever there are different animals present it is possible you will only find the victors of any fights alive and the carcasses of the losers. This page was last modified on 7 June 2018, at 19:12.